A commercial building can truly say a lot about a business. They should be professional, practical, and above all else, clean. One specific problem facing commercial buildings are dirty diffusers. Light diffusers and the ceiling tiles around them are known to have issues with dirt streaking. Luckily, with careful design practices and proper maintenance these issues can be avoided. Dirt streaking is generally caused by the constantly moving air exiting diffusers. This circulating air eventually contacts the ceiling where any particles in that air can be deposited causing the unsightly streaking.The activities within the building can also be a big factor, as people coming in or out, open windows, or really any activity that will circulate air contribute to the problem. Static electricity and condensation can also make the problem worse, as they make all of the air particles sticky, allowing them to easily attach to ceilings. HVAC air filters are often the first to receive the blame, and a poorly maintained or designed air filtration system can certainly be a factor in dirt streaking. Owners need to ensure maintenance is done, and that the system is designed according to building size and how the space will be utilised. However, even buildings with a properly functioning and designed air filtration system can have dirt streaking around diffusers. Design practices also need to be considered in order to prevent dirt streaking. It is important that there is proper insulation to prevent condensation on ceiling tiles and to make sure a positive building pressure is maintained. Once dirt streaking around diffusers is discovered owners should immediately investigate the problem and prevent the eye sore from becoming worse. One approach is to remove the diffuser and check the ducts for dirt or staining. 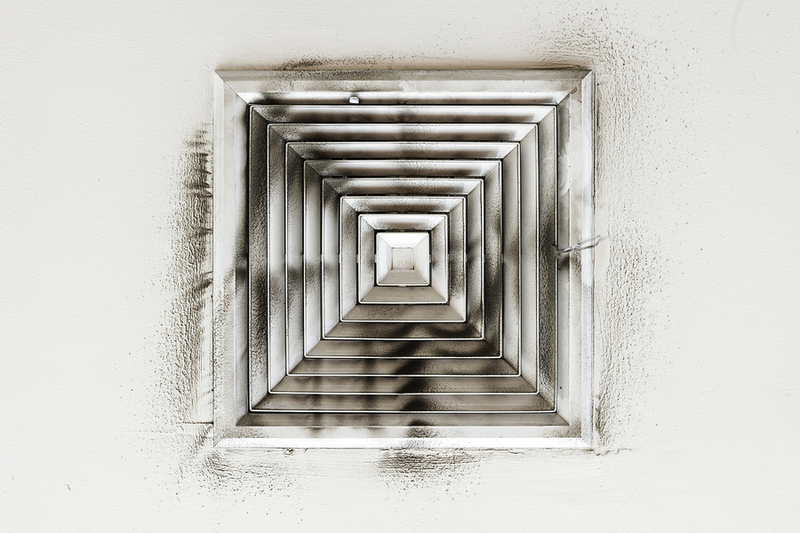 If dirt is found inside the ducts then the problem likely lies in the filtration system. If the ducts are clean, then owners and maintenance supervisors should investigate elsewhere. Dirty diffusers are an eyesore that can take away from a businesses credibility and professionalism. As owners, it is critical to ensure the proper design and maintenance of buildings, and HVAC systems to prevent this problem from occurring in the first place. To learn more about how to prevent dirt streaking, contact our Service team today.